One of the benefits of staying with locals is that we are introduced to the best recreational spots in the area. Sheree and her family have opened their home to us, and then they took us down to one of their favourite beaches — Campwin Beach. 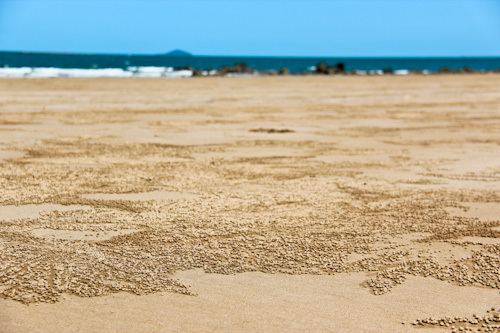 It's a good thing we came along to provide this lonely beach with some entertainment! Not only is Campwin Beach deserted, but there are very few footprints or tracks on the beach to indicate that there's a human population living nearby. 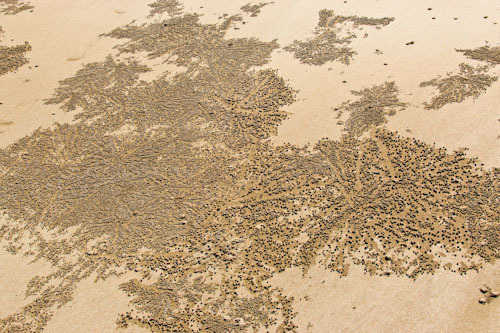 I love looking at the immaculately-formed sand spheres made by the resident crabs. 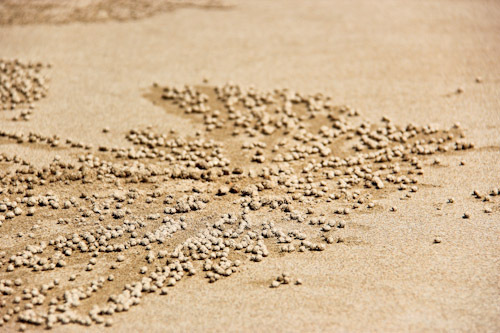 As the crabs kicks the balls out of their holes, they create fireworks of sands on the beach. Brioni ecstatically embraces the waves. It's bittersweet for me to see how much she enjoys swimming — that's a pastime David enjoys so much and would like to be doing with her. I bring Brioni's board out to her and she is laughing from the fun she's been having as she approaches me. 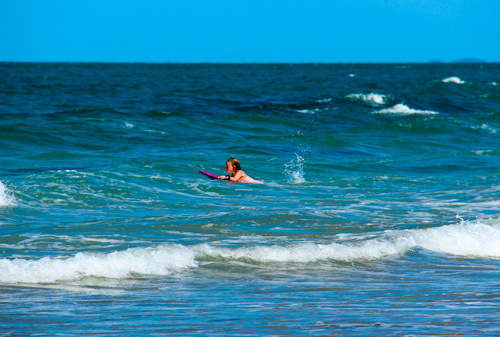 Once on the board, Brioni starts chasing the waves so she can ride them into shore. This is the first time she has ridden a body board in the surf. 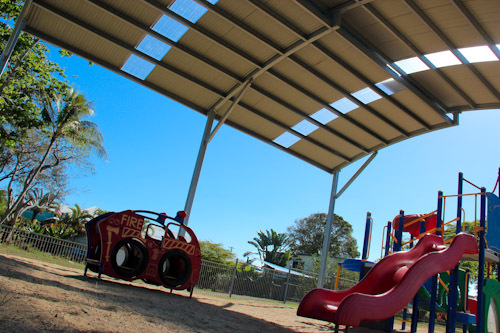 Just off the beach, behind a line of trees, a playground sits adjacent to the carpark with an ugly but functional shade shelter keeping kids cool. 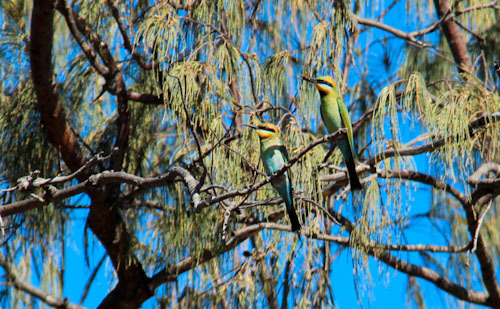 Two rainbow bee-eaters entertain us by picking insects out of the air in front of the playground. The rainbow bee-eater doesn’t nest in trees. Instead, both parents create a burrow in a sandy bank, tunnelling about a metre into the side of a bank where the female lays four or five eggs. Both male and female birds sit on the eggs and look after the young chicks. 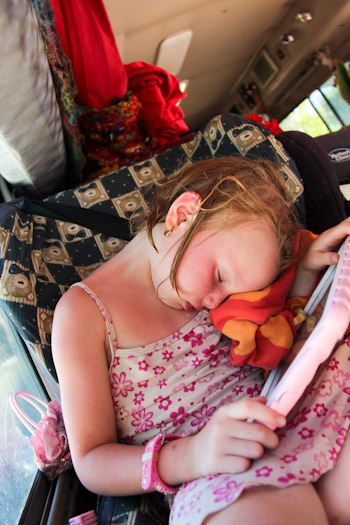 Brioni falls asleep on the two-minute drive back to the house, exhausted by her intense activity. 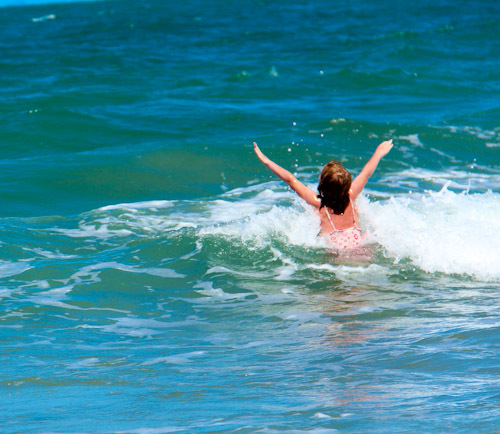 It’s wonderful be introduced to good beaches in a new place, and even better to visit a local family who are well-placed to swim almost every day because of their unschooling lifestyle. We’re happy to meet up with other families when we travel, and we’re thankful to the Floyds who have opened their home to us at Sarina Beach! My husband would be so jealous of you seeing those birds. He’s such a birder. I loved seeing the joy in Brioni’s face. It made me want to join in! What a beautiful spot. 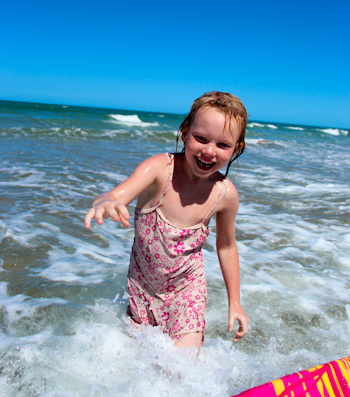 Please please please be careful letting your beautiful girls swim in unpatrolled beachs..as beautiful as they are its so easy to get caught in a rip.. i have and its scary! Wow brioni is a natural, roxy pro on the gold coast might be her cup of tea this summer, its held at Kirra beach. Or was when I was a teen. I feel like I know and enjoy all your children from reading this blog for the past few years, but I especially love seeing and reading about Brioni – she has such a fierce questing for life and adventure and wild joy in meeting the world with her arms wide open. Thanks for this little post.